Hell-O-Ween? What the heck, right? Wasn’t that just last Saturday. Well, if you know the Indies Unlimited flash fiction challenge, then you will know that they give out the written and visual prompts on Saturdays. This time around it just happened to fall on Halloween. I mean to say that the Great Cthulhu isn’t anything like the Great Pumpkin. The last thing Braxton remembered, he was being strapped to the gurney, awaiting the lethal injection. With no idea how he got here, Braxton moved slowly up the uneven stone stairs. 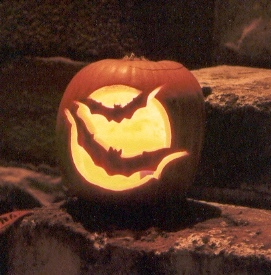 At every third or fourth step, there was another Jack-o-Lantern. The first seemed rather normal – just a couple of bats. A life displayed in pumpkins. Braxton stumbled up the stairwell, though he stopped at certain moments. Here, his first kiss, there his first love, not the same girl. And then his first kill. He had slit her throat with a hunting knife, a gift from his father. He could feel her skin, her heartbeat as it sped up when he wrapped his hand over her mouth, and then the blade as it cut into her neck. But it wasn’t right. He felt the blade slice deep into his throat, the bled well up and choke him as his life drained away. And then the next pumpkin, another death. This time he had broken the man’s nose, drove a wooden spike through the cartilage into the man’s brain. He felt every inch of the splintering wood as it drove pierced his flesh. Braxton fell to his knees with a scream. The scream his victim had never been able to release. He crawled up the next step, another victim, a new pain he had released into the world. As the sledgehammer crushed his knees he felt blackness descend. He could no longer hold his eyes open in the face of the pain he had caused. But it wouldn’t end like this, couldn’t end like this. He had done what needed to be done. All of them, every one had deserved what they had gotten. All of them, the other 39 he could see that sat on the steps ahead of him. Remember to head on over to Indies Unlimited and check out all the Hell-O-Ween stories. You might even find something worth voting for. You can still pick up A Death in the Family for free on Smashwords with coupon code YW68N until November 7th. oh there is always the dark side.